A great city isn’t just about good architecture, a healthy economy and efficient transportation. It’s about a myriad of processes most people seldom see or think about. When those processes function well they are effectively invisible, but when the demands we place on them are too great they can fail in ways that bring their shortcomings into sharp and immediate focus. This is certainly true of San Francisco’s water treatment system. Most of the time, it treats both the city’s wastewater and its rain runoff equally well, and in the same combined facilities. But when high rates of storm runoff overload the system and exceed its treatment capacity, untreated water pours into San Francisco Bay - or onto city streets. These overflow incidents would seem destined to happen more and more often as the city’s population grows and stronger-than-average storms become more frequent, yet traditional solutions such as building greater treatment capacity may be too expensive for San Francisco to undertake. Clearly, the City must strive to reduce the number and impact of these incidents, but how? Unlike many cities, San Francisco sends its wastewater and storm runoff through the same treatment process. During large storms, the high volume of water overloads the capacity of the combined sewer system, causing overflows that pose significant environmental and public health problems. Urban stormwater runoff also poses a significant risk of localized flooding. Because this flooding is widely distributed and unpredictable, conventional solutions have ameliorated these problems selectively, leaving many communities without sufficient protection and raising questions about environmental justice and equity. The potential impacts of climate change could make such flooding even more complicated and unpredictable. Traditionally, when engineers confront a problem of insufficient capacity they seek to build more capacity. But these engineered solutions involve expensive infrastructure that is difficult to build, operate and maintain. The fact that in San Francisco’s climate the amount of rainfall is highly variable means that the traditional engineering approach is particularly expensive: It is extremely difficult and expensive to build a system large enough to handle the maximum treatment demand generated by occasional large storm events. In San Francisco, an elaborate collection and treatment system has been installed for use during storm events in an attempt to prevent flooding. However, despite the effort the City has put into improving sewer capacity and performance, eliminating all overflows and flooding through these methods remains cost-prohibitive. What, then, can San Francisco do? The answer requires a fundamental change in the way we think about and respond to stormwater. Instead of thinking of this water as something to be collected and treated, then disposed of outside the city, San Francisco must start seeing this water as a resource and reduce the amount of it that is shunted into the City’s treatment system. An approach that looks at San Francisco as a watershed could do more than address sewer overflows. It could also reduce stormwater runoff rate and volume, provide for some treatment for improved water quality, and harvest rainwater for productive uses. 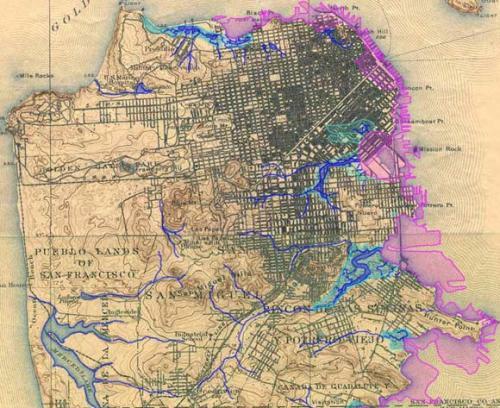 Pre-development natural creek systems of San Francisco. Neighborhoods built in low-lying area over historic creeks often experience flooding in severe storms. This alternative approach seeks to redesign the urban landscape to minimize the volume of runoff that flows into the sewer system. Using age-old stormwater harvesting techniques with modern implementation strategies, this approach shifts the focus from remediation to prevention by slowing, percolating, retaining and treating water where it falls, all before entering the piped wastewater system. By maximizing the amount of water that infiltrates into soil for natural treatment, the hydraulic capacity of the sewer system may be freed during rainstorms, which minimizes the incidence of overflows and localized flooding. Built on an integrated range of solutions, this alternative approach to stormwater management provides a greater overall benefit per dollar invested than traditional solutions. The time is right for San Francisco to implement this new approach to its stormwater treatment. The City will spend an expected $2 billion over the next few decades on the San Francisco Sewer System Master Plan Project. The existing $2 billion Water System Retrofit Bond Program is already facing price escalations. San Francisco must investigate cost-effective and sustainable technologies for stormwater management. The range of integrated solutions proposed may provide greater benefit per dollar spent, while also providing environmental, societal and economic benefits. The director of city greening in the Mayor’s Office and the San Francisco Department of Public Works already have developed an ordinance addressing the need for landscaping that allows the ground to absorb rainwater. They continue to work with Plant SF, a community organization invested in promoting the use of rain-absorbing landscaping, to increase the number of plantings in public rights-of-way and private spaces. Friends of the Urban Forest, another non-governmental organization involved in community partnerships with municipal agencies, provides financial and technical assistance to San Franciscans who would like to plant new trees and maintain existing trees along the city’s streets. Additionally, the development of the San Francisco Streetscape Master Plan, which will produce ecologically sensitive design standards that address streetscape management and maintenance issues, may provide support for green street design at the highest levels of municipal government. Funding for such initiatives is available from a wide range of sources. In light of the clear need to rethink the way the City treats its stormwater, and the momentum already generated for environmentally sensitive approaches to urban infrastructure, in this report SPUR explores four inter-related strategies that allow for greater stormwater storage and infiltration of rainwater into the ground while providing numerous community and environmental benefits: increased urban forestry, ecologically sensitive street and park design techniques, rainwater harvesting and green roofs. This report also explores model programs and potential sources of both private and public funding, examines the range of benefits offered by each strategy and discusses what further study is needed. In February 2004, a storm brought winds up to 96 miles per hour and about two inches of rain to the Bay Area.1 The sewers overflowed and the surcharged pressure was strong enough to push off manhole covers. Because the city streets were not able to capture and slow enough water before it raced through the sewer system, the volume of water exceeded system capacity and untreated water was released into San Francisco Bay. Although this particular storm was rated as a 1,000-year storm, variations of this pattern happen almost every year when a major storm hits. Stormwater runoff occurs when rainfall hits impervious surfaces such as roofs and sidewalks and is unable to infiltrate into the earth toward the water table. Instead, water travels over these surfaces and is directed into pipes. From there, it collects in storage basins or underground detention pipes before moving on to one of the water treatment facilities. Currently, approximately 70 percent of precipitation in the city is directed into the sewer system. During intense storms, rainfall accumulates quickly and can overwhelm the pipes. Increasing the size of the storage basins and pipes is very expensive. As it flows over the streets, water that falls during rainstorms picks up pollution, which can include toxic particles from tires and brakes, sediment, motor oil, animal droppings, litter, and other garbage. In the 1970s, in an effort to comply with the Clean Water Act, San Francisco built a "moat" around the city to capture and treat this water, preventing these pollutants from flowing directly into the Bay and the Pacific Ocean. Today, nearly all of the rain that falls on the sidewalks, rooftops and streets goes into combined sewer pipes that direct the stormwater to one of the City's three treatment plants. San Francisco's wastewater system divides the city into two regions served by three treatment plants. The Southeast Treatment Plant treats the majority of the city's wastewater. The 50-year-old Southeast Plant in the Bayview is the workhorse of the wastewater system - it takes 80 percent of the city's sanitary sewage and treats most of the stormwater from the northern and eastern parts of town. When this plant reaches capacity, the 65-year-old North Point Plant on Bay Street near the Embarcadero is activated to treat the excess water. The Oceanside Plant near the San Francisco Zoo treats runoff from the west side of the city. Approximately 33 billion gallons of sewage and stormwater are sent through the system annually. While no current strategy can eliminate all overflows, San Francisco as a community has repeatedly expressed a desire to reduce the number of overflows to a level that does more than merely comply with regulations. During heavy rainfalls, overflows can occur in low-lying neighborhood streets or in basements. Such problems can be particularly alarming near the Southeast Plant, as well as in other lower lying neighborhoods near historic creeks, aggravating long-standing environmental-justice concerns. San Francisco's outdated sewage and stormwater system contributes to the degradation of the Bay, our neighborhoods, and our health. Since passage of the 1972 Clean Water Act and adoption of the City's 1974 Clean Water Master Plan, San Francisco has spent more than $1.4 billion to improve its stormwater facilities and reduce the frequency and volume of sewer overflows. A key component included the addition of a series of collector pipes around the city to store and transport stormwater to the treatment plants. Subsequent research conducted regarding combined sewer overflows found that while the upgrades have reduced the number of CSOs sufficiently to meet regulatory requirements, some overflows continue. According to the San Francisco Public Utilities Commission, the improvements have reduced CSOs to 10 permitted overflows per year. Despite the sharp reduction in these overflows, current overflow rates average 1 billion to 2 billion gallons per year, according to SFPUC Assistant General Manager for Wastewater Tom Franza. In its most recent Clean Water Act permit from the Regional Water Quality Control Board, the SFPUC was instructed to investigate the total elimination of CSOs. This wastewater management plan and the subsequent rebuilding of the sewer system provide a once-in-a-century opportunity to rethink the way San Francisco manages its water system. The sensible alternative to building more capital-intensive capacity is to prevent water from entering the system in the first place. This would reduce the chance the system would become overburdened during peak rain events, thereby reducing the likelihood of flooding and overflows while redirecting the water toward beneficial uses. There are a number of proven techniques to better manage stormwater that do not involve conventional piping and storage. The watershed approach shifts the focus from the rapid capture and removal of stormwater from the site to the deployment of a range of treatments that slow down, infiltrate, pre-filter and capture as much of the stormwater as possible. These treatments aim to keep stormwater out of the system, treat it for beneficial reuse or slowly release it into the system after the rains have passed. When implemented on a large scale, the watershed approach enhances stormwater quality, minimizes localized flooding and reduces overflows. This method of stormwater management improves the ability of the system to handle peak storm events and increases community interaction with natural systems. A key element of an integrated stormwater infrastructure is more public green spaces that serve as ideal places in which neighbors can interact and as valuable pieces of urban wildlife habitat. On average, the amount of stormwater that can be intercepted and absorbed by a single tree can range from 845 gallons to almost 2,400 gallons per year.3 The trees' ability to do this depends on many factors including the canopy width, tree type (evergreen or deciduous), rainfall intensity and wind. Trees are able to absorb and release an immense quantity of rainwater. Rain will eventually fall through the tree canopy, but at a slower rate than rain that falls directly to the ground. This slow metering out of water allows for slower runoff rates and better absorption by the soil. Recent case studies have shown that trees provide a variety of benefits in managing stormwater. They catch and reduce rainfall rates to the ground, absorb and transpire large amounts of precipitation, and act as pollution filters. In Los Angeles, the Trans-Agency Resources for Environmental and Economic Sustainability program promotes innovative stormwater practices and has carried out innovative pilot projects for stormwater landscaping. The Hall House, in southern Los Angeles, uses rooftop diversion, swale systems and cisterns to water plants. In addition, there is an extensive two-year monitoring program to evaluate the project's success, with hopes for expansion elsewhere around the city. San Francisco streets have a tremendous opportunity to utilize existing sites for planting - 56 percent of all available street tree sites (127,500 sites) are currently unplanted, accounting for more than half of available sites. Furthermore, the conversion of unused or underused areas for tree and landscape planting is one of the best ways to economically increase the urban forest. While San Francisco is densely developed, solutions can be implemented to increase the number of sites for vegetation. For example, this may entail creating open spaces for public enjoyment (with many additional benefits) while providing stormwater benefits or adding permeable paving in streets, parking strips and sidewalks, resulting in creating a greater infiltration capacity. In some areas, sidewalk width may be increased to add a strip of trees while preserving the pedestrian path. Other potential solutions include planting in roadway medians and sidewalk edges. Nevertheless, trees and landscaping should not be added indiscriminately. Care should be taken to ensure that there are no conflicts with utilities or other streetscape features such as traffic signs by considering root growth and the mature height of trees when selecting which species to plant. Effective tree planting strips should be approximately five to eight feet in width to ensure proper tree health. These changes should be implemented first in areas that most greatly affect overflow problems. These include areas with recurring flooding and draining problems. Because the topographic features and soil types of San Francisco are as diverse as the city itself, specific design recommendations should consider these elements as well as the street type, pedestrian traffic and aesthetics to ensure that a balance is reached between the use of space and stormwater mitigation. Rooftops account for a large percentage of the total area of the city and therefore have a high potential for redevelopment or landscaped areas. Commonly termed "green roofs" or "roof gardens," these truly urban landscapes prevent water from entering the stormwater system by using and evaporating water. With the majority of its water needs met by rainfall, the green roof is like a self-sufficient ecosystem. Green roofs also have the ability to reduce the summertime temperature on the roof surface by approximately 50 degrees on summer days compared to typical roof surfaces, resulting in much cooler temperatures inside the building.5 A combined cooling effect to the city due to the installation of many green roofs can act as open space, and in turn reduce the summertime 'urban heat-island effect." This effect occurs when the temperature in the city can be as much as 8 degrees Celsius warmer than the surrounding region due to the added heat generated from roof surfaces and pavement. Naturally, cooling costs decrease with the use of these vegetated surfaces, and heating costs are potentially reduced due to the cooler roof and slightly increased insulation provided by the plants. The City of Chicago Department of Planning and Development has implemented a program that mandates green roofs on a certain percentage of the roof area for new buildings of certain types.8 In fact, according to Green Roofs for Healthy Cities, Chicago led North American cities in 2005 with 295,000 square feet of completed green roofs. This rating did not include the nearly 2.5 million square feet of green roofs that are in various stages of development on more than 200 public and private structures in Chicago. Chicago also boasts two award-winning, recently constructed vegetated spaces: the 1.1 million-square-foot Millennium Park, which covers a parking garage and an underground train terminal, and the 239,580 square-foot park at Soldier Field, which was reclaimed from former parking lots and garages.9 Green roofs also exist in San Francisco, such as those atop the Civic Center and the Yerba Buena Garden, though those people invested in making San Francisco a model environmental city would like to extend the use of green roofs to significantly more public and private spaces. Utilizing stormwater that falls on a site can further reduce the load on the combined sewer system. Water reuse can also reduce the strain on the source supply, thereby helping to maintain adequate levels of water during dry seasons and years, and reducing the annual strain to our reservoirs. Increased stormwater use may minimize the need to expand our reservoir and dam infrastructure system. Stormwater captured can be used for irrigation as well as used for many emerging graywater and storage technologies. Stormwater captured in cisterns or retention ponds can be reused to irrigate landscaping on a residential or community scale, or even provide water for industrial processes. The City of Los Angeles constructed large underground cisterns in areas prone to flooding. These storage facilities detain and treat runoff, eventually releasing the water for groundwater recharge or irrigation. In addition, with further planning, these cisterns can store water for on-site benefits, such as fire protection and landscape irrigation. For example, Bode Gravel Company, located along the Port of San Francisco' s Southern Waterfront collects stormwater for use in its ready-mix concrete production process. As the population of San Francisco continues to grow, and with it the demand for water, it will be necessary to develop surplus capacity - not through reservoirs that do not overflow the sewer system, but through other means. For residential and commercial applications, an on-site treatment device can clean water to a standard set by the California Department of Health Services for recycled water.11 Recycled rainwater is safe for swimming, fountains, car washes, school grounds and fire protection. Although not intended for human consumption in large quantities, nonpotable water is in widespread use and there have been no reported cases of illness to date. Community parks can reuse water from cisterns firsthand to decrease cost and conserve water for other needs of the city. Emerging green building technologies have been shown to reuse some of the building' s stormwater on site in unconventional ways. At the Nuremberg Prism in Germany, stormwater runoff is utilized for air conditioning, fire fighting and plant watering.12 Rain that falls from the roof of the building is directed to water spouts between the walls, and the water is filtered and routed to an interior pond and underground cistern. Water for the vegetation is supplied completely by the circulation system, which creates natural air conditioning by drawing fresh air into the building from exterior vents. Street design can help manage stormwater by decreasing its runoff rate and volume, and increasing the potential for stormwater runoff to be infiltrated into the groundwater. Redesign of street sections and sidewalk structures can include the use of permeable paving and landscaping to reduce stormwater. In the pre-development condition, rainwater runoff from storm events is infiltrated into the soils, trapped and transpired by trees, or collected in natural streams and wetlands. The goal for sustainable urban design for stormwater includes mimicking this concept in an urbanized environment. Infiltration occurs when soil, gravel or sand allow water to flow through it instead of running over its surface. By using permeable paving for sidewalks, parking strips, alleys, bicycle trails, park paths and parking lots, infiltration could be increased. Decreasing the amount of impervious surfaces by replacing paved areas with landscaped areas or pervious pavements would also increase infiltration rates. In addition, the surfaces of landscaped areas can be graded to divert the largest amount of water to the base of the tree. Stormwater infiltrating the sandy soils of some parts of San Francisco is the natural cycle, yet currently approximately 70 percent of precipitation in the city is directed into the sewer system.13 Increasing the amount of stormwater infiltration will reduce the load on public infrastructure and decrease the occurrence and volume of overflows. The ability of a certain area to allow infiltration is based on soil type and groundwater levels. Infiltration can be achieved using permeable paving above appropriate permeable soils or sub-bases. Installation of rain gardens, landscaped infiltration areas, temporary ponds, sand media filters under playing fields and bioswales - vegetated earthen berms and embankments - also increases infiltration. Detention of stormwater can reduce the amount of runoff into the stormwater system by storing the peak runoff in soil and releasing at a slower rate. Gravel-filled detention basins or trenches can be placed under large parks, playfields and parking lots to detain stormwater, which will then be slowly released back into the natural groundwater or sewer system. Open spaces can be used for water-quality treatment, such as tertiary treatment areas along the San Francisco Bay shore similar to those at the Arcata Marsh in Humboldt County. Relatively little space is be needed for these systems, and they can be integrated into the urban landscape near parking spaces, parks and underused streets. Permeable paving allows water to pass through air pockets in the material itself. Using permeable paving can reduce the amount of stormwater runoff without changing the function of a space. Permeable paving has been used on highway shoulders and in parking lots. Maintenance costs for permeable paving may be more significant than those for traditional methods, but they can require fewer infrastructure improvements (such as curbs and gutters). In addition, the need for compliance with the requirements of the Americans with Disabilities Act must be taken into account. Many permeable paving materials that meet ADA standards are available. Dry set paving and permeable paving have been successfully applied in sidewalk, plaza, parking strip, alley, planting strip, school-yard, driveway and playground sites. There are numerous opportunities to use permeable paving in San Francisco from parking strips to public plazas. However, to fully optimize the infiltration of permeable paving, site-specific slope and soils need to be understood and considered when using permeable paving. Opportunities to increase planting and detention in the public right-of-way exist, but will take the cooperation of many departments. Many of the most environmentally damaging materials are picked up as water runs over streets, especially after a prolonged period without rain. Water from the first storm of the season is typically the most polluted stormwater. If this first storm is a large one, runoff may be discharged untreated, which can have many implications for human and marine habitat health. Pollution without a single source - non-point source pollution - now leads to more beach closures than any other cause, makes urban water bodies unsafe for contact and represents the main source of new water pollution.15 Water that cannot be diverted from the stormwater system can be routed to and first sent through vegetated grass areas, sand and/or compost filters to remove pollutants prior to discharge to the sewer system. Bioswales, planting strips and parking strips can all perform this function. Reducing runoff volume into the storm system would reduce the potential for releasing pollution into San Francisco Bay and the Pacific Ocean. It also might allow the current collection infrastructure and treatment system to operate as intended and allow an even greater amount of the wastewater discharged from our facilities to be properly treated. Controlling the sources of pollution and other on-site control measures should be considered as well. 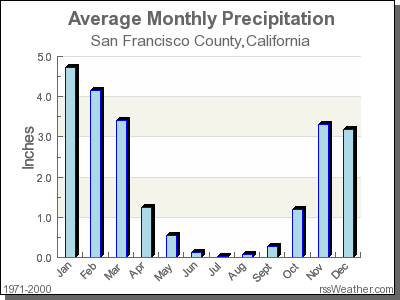 San Francisco's average rainfall by month, 1970-2000. San Francisco's rainfall varies greatly by season, but traditional stormwater infrastructure must be built to handle the heaviest periods of rain. Source: www.rssWeather.com. The approach to stormwater management outlined in this paper will require coordinated action across many public agencies. This section contains our policy recommendations, organized by department. Ensure that the vision of integrated stormwater management is central to the design of streets and parks, so that they are thought of as core components of the city' s ecological infrastructure in addition to their functions as transportation corridors and public space. The Public Utilities Commission is the single most important agency responsible for proposing and implementing the strategies discussed in this paper. The SFPUC is responsible for treating San Francisco' s sewage and stormwater and managing the regulatory permits that allow the City to discharge treated sewage and stormwater, as well as combined sewer overflows, into the Bay and Pacific Ocean. A significant portion of the water and sewer rates collected goes toward managing stormwater. The need to update and upgrade San Francisco' s wastewater management infrastructure is unquestioned, and the voters have already authorized the SFPUC to pay for this work with a surcharge on water bills (with Proposition A in 2002). The key issue facing the public is how to best allocate this forthcoming investment. 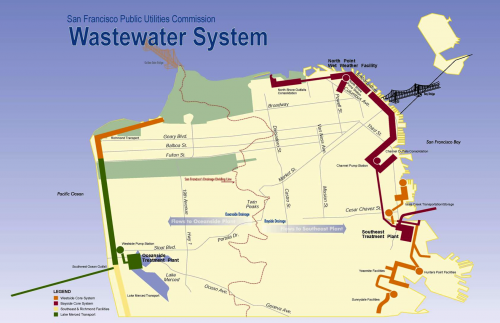 The SFPUC has embarked on a long-awaited planning process to develop a new Wastewater Master Plan to modernize San Francisco' s wastewater infrastructure. This new Master Plan will determine the City' s water management approach for the next 30 to 50 years and is expected to cost upwards of $2 billion to complete. As part of this effort, the PUC is developing a hydraulic model to accurately describe how water behaves in the collection system and identify infrastructure strategies for managing stormwater flows. Additionally, the agency is beginning a $150 million, five-year interim capital improvement program that is in part designed to reduce the threat of flooding in vulnerable neighborhoods. The use of a watershed-based approach to stormwater management will significantly change how the SFPUC funds the wastewater system' s operation and maintenance. The shifting of the infrastructure from below-ground pipes and pumps to the above-ground urban forest, streets, and distributed stormwater harvesting will require a corresponding shift in expenditures. Current work at the SFPUC shows great momentum to create stormwater management innovation. Restructure the sewer rate structure for all San Francisco ratepayers to be proportional to the amount of impervious surface on the site. This is the most direct way for the PUC to provide incentives to property owners to manage the water that falls on their property in a sustainable manner. When a property owner reduces impervious surface (for example, by replacing a standard concrete drive way with permeable pavers or by installing a green roof), s/he would petition for a reduction in the monthly sewer bill. Undertake demonstration projects of green roofs, permeable paving, and other wastewater management techniques throughout the city to speed up adoption by the private sector and by other public agencies. Complete the hydraulic model and produce a soils map to prioritize the blocks in San Francisco for rainwater infiltration and other low-impact development strategies. Based on this soils map, work with the Department of Public Works to create street design standards for infiltration wherever this is feasible. Within the Wastewater Master Plan, investigate all feasible methods of reducing the volume of water that must be pumped to sewage treatment plants. We should not assume that the only choice will be the one that costs the least money in the short run; rather, we should bring alternatives to the citizenry, which may be prepared to spend slightly more money to achieve environmental and environmental justice goals. In the city' s remaining "mega projects," (such as Treasure Island, the Hunters Point Shipyard, Candlestick, and perhaps others), support project sponsors to design separate stormwater collection systems as in Mission Bay and self-contained wastewater treatment systems as in New York' s Battery Park City. Begin implementation of cost-effective recycled water projects on the west side of the city and integrate east side recycled water projects into the overall Sewer Master Plan. Investigate the idea of daylighting perennial creeks or at least separating them from the combined sewer system in locations where perennial creeks are currently being treated. Consider stormwater management within future neighborhood plans, including design guidelines, code provisions regarding rooftops, siting and design of parks, and especially the design of streets. While planners will have to rely on expertise from the Public Utilities Commission and will have to engage landscape architects or other consultants to come up with technically feasible plans, this is an issue that needs to be considered from now on. Encourage sponsors of new development and large adaptive reuse projects to utilize permeable pavement, green roofs, rainwater harvesting and other integrated stormwater management techniques. Change its materials standards for streets to permeable pavement wherever groundwater infiltration is an option, based on PUC maps. Undertake pilot projects to test new methods of promoting rainwater infiltration or detention in the public rights of way and/or medians, in preparation for a change to the overall street design standards that will eventually treat these as the goals everywhere in the city. Clarify the ownership structure and maintenance responsibilities for street trees. Trees that are not well maintained will not serve the purpose of stormwater management programs. Centralize tree maintenance and ensure ongoing monitoring by the City to ensure that all trees are monitored. Enforce current tree pruning standards, where removing 25 percent of the tree is illegal. Revise the standard planting dimensions for street trees to allow them to live longer and grow larger; at the same time, design tree wells that better protect sewers from roots. Seek a solution to the conflict between street trees and utility lines with the goal of creating a place for street trees to grow on virtually every street in the city. Investigate the possibility of using community benefit districts (in which property owners voluntarily levy extra fees on themselves to pay for extra neighborhood services) to provide enhanced street tree maintenance in selected areas. Work collaboratively with the PUC, DPW and the Planning Department - whose staff is leading the Streetscape Master Plan efforts - to ensure that wastewater management is incorporated as a basic design parameter in street designs. Ensure that stormwater gets consideration in the Streetscape Master Plan. The Streetscape Master Plan seeks to address the following components: pedestrian quality of the sidewalk environment; landscaping; street furnishing; lighting; and best management practices in ecological street design and stormwater management. In other words, the project has been scoped correctly, but the stormwater component, because it may be less well understood by the transportation professionals who will be the major players in the plan, needs to be given special attention. Work with the SFPUC to identify park lands and potential park lands that could be adapted to also serve a stormwater management role. Dual-use parks all over the world serve as rainwater overflow basins during floods or heavy rains, providing an amenity that also does infrastructure work. Incorporate rainwater management as a design parameter in key park modernization and rehabilitation projects as identified above. Facilitate the adoption of green buildings by the private sector, with a focus on water management techniques, such as green roofs and waterless urinals. Provide marketing support to highlight case studies of successful San Francisco projects. The Redevelopment Agency is in a position to affect both infrastructure design and building standards in new redevelopment areas. This will require a fundamental addition to the mission of the Agency to focus not just on affordable housing and economic development, but also on environmental sustainability and place-making. Require new buildings within redevelopment areas to be green buildings, based on the approach in the current Green Building Ordinance, which applies to municipal buildings. In large redevelopment areas, work with the SFPUC to design integrated stormwater management systems that do not increase the load on the current sewer system, either through separating stormwater from the sewers or by creating self-contained water treatment systems that handle all the water within the project area. Encourage waterless urinals in residential and commercial projects. Encourage the use of green roofs. Promote rainwater and diversion harvesting within a site so that rainwater is not always required to be pumped into the sewers. All of these design strategies could have adverse impacts on neighboring property owners if done poorly. DBI must serve as the regulatory agency to ensure that construction is safe and does not negatively affect other people. Nonetheless, DBI needs to adopt and embrace these techniques and provide guidance in proper implementation rather than continue to outlaw them. The current practices have negative consequences "downstream" where the combined sewer overflows happen, albeit removed from the immediate properties DBI regulates. These recommendations do not exhaust everything the City government could be doing to promote integrated stormwater management. Nor do they include the critical contributions that voluntary civic groups like Friends of the Urban Forest, Plant SF, or the Neighborhood Parks Council can do to affect the city' s urban landscape. The need to update and upgrade San Francisco' s wastewater-management infrastructure is certain. The traditional combined collection and treatment system is not adequate, and it would not be financially feasible to increase the size of the existing infrastructure enough to absorb heavy and rapid rainfall without any sewage overflows. However, an integrated wastewater management system would decrease the volume of water entering the sewer infrastructure and the Bay, minimize the burden on the below-ground water treatment system and maximize the use of rainwater as a resource. This new, holistic watershed approach encompasses many aspects of San Francisco' s public works infrastructure, not just its current wastewater management system. The shifting of the infrastructure from below-ground pipes and pumps to above-ground vegetation, surfaces, and stormwater harvesting tools would require an integrated, interdepartmental approach among the Mayor' s Office, the SFPUC, the Municipal Transportation Agency, the Department of Public Works, the Recreation and Parks Department, the Department of City Planning and the San Francisco Redevelopment Agency, as each has oversight of or involvement policy measures required for implementation with sewer systems, city streets and trees, construction oversight and approval, open spaces, transit, planning and development, and environmental review. Such an approach would require several paradigm shifts: from stormwater as waste to stormwater as a resource, and from the up-front bottom line to the long-term return on investment. This new approach also would require a shift in expenditures. The SFPUC must therefore develop methodologies to properly value the contribution made by this new infrastructure, and subsequently fund its development and maintenance. The SFPUC' s Wastewater Master Plan will determine the City' s water-management approach for the next 30 to 50 years. San Francisco now has a unique opportunity to reconfigure its stormwater management techniques in alignment with a modern, watershed-based approach that reduces the risk of flooding and decreases the burden on the existing infrastructure - while providing many benefits to the community. Despite the significant challenge in making San Francisco' s stormwater management sustainable through innovative methods, significant opportunities exist to create a stormwater infrastructure that is effective and improves San Franciscans' quality of life. By revolutionizing the way we deal with stormwater, San Francisco may become a frontrunner in the environmental cities movement, as have other major cities nationwide. SPUR urges San Francisco' s leaders to take decisive and positive action to move the city in this direction now. The Green Streets program of the City of Portland, Ore. has been evolving since the mid-1990s. Before the city created a formal program, one innovative project set the tone for the future program. The Oregon Museum of Science and Industry parking lot swales project was a very early project in Portland that predated the current Green Streets program that has influenced both the planning policy and physical design of alternative stormwater management projects throughout the city over the last several years. This project incorporates many of the same design principles present in the Green Streets program and is still seen as a model stormwater management demonstration project. Located adjacent to the Willamette River, the museum' s four acres of parking lots drained approximately 522,000 cubic yards of untreated runoff into the river.16 When the museum looked to redevelop the site, the City of Portland recognized an opportunity to begin addressing the mandates of the Clean Water Act to clean up its water by treating polluted runoff and decreasing the amount of water that enters the Willamette River. From a physical design standpoint, the project has shown that it is possible to obtain significant cost savings and benefits from the construction of sustainable management systems over conventional ones. It has further shown that these systems have the potential to surpass the performance of traditional practices. Where shortfalls in the system have been found, modifications were made to address them. Where it was found that the swales could have performed better, for example, the number of curb cuts was increased. The performance of particular plants was evaluated, and where appropriate, they were replaced by better-performing ones. Similarly, the Green Streets projects have yielded information that has influenced planning policy. The success of the project has influenced the code governing parking requirements, to allow developers to manage stormwater on-site while keeping important spaces. Furthermore, this project and others strongly affected how the current stormwater management code for the city was written. Part of a larger stormwater management program, the Innovative Wet Weather Program in Portland is an initiative to develop projects and the associated project-management infrastructure (funding mechanisms, monitoring and public relations) that manage and treat runoff from the city' s developed areas. The goal of this program is to keep runoff from entering the stormwater system when possible, and in cases when this is not feasible, to manage it before it is released. The impetus to develop ways to clean up runoff entering Portland' s watersheds derived from the federal Clean Water Act amendments, which were passed in 1987. In 2003 and 2005, the City of Portland was awarded two grants totaling $1.68 million to further invest in these and other public and private projects that "demonstrate sustainable stormwater management solutions." The City of Portland added another $1.35 million in matching funds. Projects that are funded by the Innovative Wet Weather Program are broken out into five categories: water-quality-friendly streets and parking lots (also known as "green streets"), downspout disconnections, eco-roofs, monitoring and feasibility studies, and educational efforts. The projects constructed under the Green Streets category must accomplish the goals of reducing the occurrence of overflows where sanitary and storm sewers are combined, treating polluted runoff, and increasing the amount of vegetation in the city. Both public and private projects have been constructed or are being considered in this category. They range from simple retrofits to the design and installation of new pervious paving surfaces. The monitoring and feasibility category of the Innovative Wet Weather Program serves not only as a tool with which to monitor the effectiveness of the constructed projects, but more generally as a planning tool that can be used to more effectively determine stormwater management policy. The NE Siskiyou Green Street is a demonstration project that extended curbs along a residential street to accommodate construction of two landscaped swales on either side of the street that would capture runoff from the street surface. The extensions allow runoff to enter the vegetated swales through a series of flush cuts in the curb. It is then filtered through a backfill mix of sand, topsoil and compost. The catchment areas for the two curb extensions total approximately 9,300 square feet and have a storage capacity of 120 cubic feet. The demonstration project was completed in two weeks at a cost of $20,000, which was part of the EPA grant. Another "Green Street" stormwater management demonstration project in Portland is the New Seasons Seven Corners Store project. In this project, water from portions of Division Street is directed into a series of landscaped planters between the curb and the sidewalk. It is anticipated that when the vegetation is established, approximately 1 million gallons of runoff will be removed annually from the existing combined sewer and stormwater system. This project was initially selected for funding through the Innovative Wet Weather Projects; $50,000 was budgeted for the construction of this project. 1Nolte, Carl, Rubenstein, Steve and Lelchuk, Ilene. "Winter Express Slams Bay Area with Tropical Rain, Hurricane Winds." San Francisco Chronicle 26 February 2004: A15. 2San Francisco Urban Forest Council. San Francisco Urban Forest Council Annual Report. September 2005. 3Bandy, Leslie. "Non-Infrastructural Solutions for San Francisco's Combined Sewer Overflow Problem." San Francisco: 2003. http:www.plantsf.org/PL_bandy_2003.pdf. 5Millett, Katherine, "Birds on a Cool Green Roof: Can the roof of Chicago's City Hall take urban nature to a higher level?" Chicago Wilderness. Summer 2004. 4 May 2006. 6City of Chicago, Illinois. "About the Rooftop Garden." 4 May 2006. 7City of Chicago, Illinois. "Monitoring the Rooftop Garden's Benefits." May 4, 2006. 8City of Chicago, Illinois, Department of Planning and Development. Building Green/Green Roof Matrix. 9Wisby, Gary. "City Hall's Spreading the Green: Will Help Fund More Planted Roofs." Chicago Sun-Times. June 29, 2006. August 14, 2006. 11City of Redwood City, California, "Answers to Frequently Asked Questions about Redwood City's Recycled Water Project." May 4, 2006. 12Dreiseitl, Herbert, Grau, Dieter and Ludwig, Karl H.C. "The Climate in the Nuremberg Prism," Waterscapes: Planning, Building and Designing with Water. Basel, Switzerland: Birkhauser Publishing Ltd., 2001. 14Uni-Group USA. April 17, 2006. http://www.uni-groupusa.org/case.htm. 16City of Portland, Oregon, Bureau of Environmental Services and CH2M Hill. "Environmental Assessment: Innovative Wet Weather Program," 2004. 17City of Portland, Oregon, Bureau of Environmental Services, Sustainable Stormwater Program. "Oregon Museum of Science and Industry (OMSI) Parking Lot Swales." 18City of Portland, "Oregon Museum." The principal authors are S. Bry Sarte and Adam S. Han, both of Sherwood Design Engineers, and Leslie Bandy.